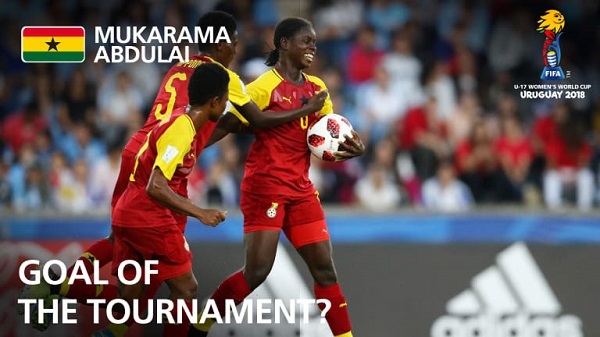 A FIFA Committee has shortlisted goals scored by Ghanaian pair Abdulai Mukarama and Suzzy Teye for best goal of the tournament award at the 2018 FIFA U17 Female World Cup. Mukarama, Ghana’s captain, scored a great strike for the Black Maidens when the West Africans dismantled hosts Uruguay 5-0. The Ladies Striker star netted a hat-trick in that game but her third goal has been nominated by FIFA for the award. Suzzy Teye gets the nomination in the category after she scored a brilliant goal from a Mukarama assist against Mexico in a quarter-final clash of the competition. Voting closes at noon CET on Monday 10 December, which is 11:00 am Ghana time. Mukarama won the Top Scorer Award with 7 goals and was named the third best player at the tournament.